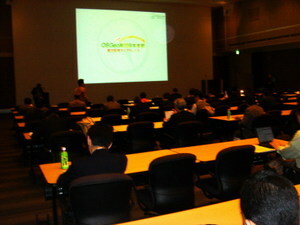 The Japan Chapter of the OSGEO held its first seminar at the Tokyo Convention Center. I have heard that more than 170 people attended, which is a tremendous turnout. Kazunori Noda, well-known in the geospatial community in Japan was MC. 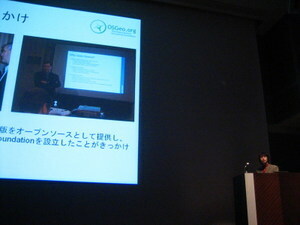 Toru Mori, Founder, President and CEO of Orkney presented an overview of the development of the OSGEO. 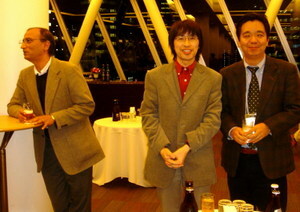 Myself and Professor Venkatesh Raghavan of Osaka City University were invited to give keynotes. In addition there something like 14 main stage presentations on MapServer, MapGuide, GRASS, and other open source projects. Ed Parsons always ends his blogs by reporting where he is when he submits his latest blog. In this case, I'll do the same. Sumitted from 37,000 feet on Lufthansa 779 using my OQO, which is the only computer compatible with an economy seat on a 747.